1st floor unit in the Sunset Cove complex. Formerly called Treasure Island. The name was changed after we restored the stone wall that protects our beach. Close to everything including grocery stores, shopping, restaurants and a short walk to Georgetown. This is a family owned unit and my wife and I will be spending our retirement years here where our children and grandchildren will visit us. Until then we hope to have others use it to enjoy this beautiful Caribbean island. We looked at a lot of condo complexes on seven mile beach and selected this one because it felt more like a resort than a condo complex. Try it, you won't be sorry. Wonderful condo and location! Larry was great to talk to....very prompt to answer questions! Just about anything you wanted was with in walking distance. My family is already planning for next year! Thank you Larry, you have a wonderful place! Convenient and Comfortable! Great Beach! We are just back from a week in Larry's condo. We loved being on the first floor and just steps from the beach. The beach there is wide with plenty of lounge chairs and umbrellas and easy swimming. Our daughter and a college friend met my husband and I there, so the layout with 2 bedrooms and 2 bathrooms was perfect for us. The condo is comfortably furnished and nicely decorated. The kitchen is well equipped and there were plenty of linens including beach towels. We had a bit of a glitch resetting the door code, but Larry was available instantaneously by phone and helped us out. The grocery store was within walking distance, and we tried lots of local restaurants by walking there or catching the public bus running constantly up and down West Bay Road (thanks for the tip Larry!). We liked the restaurant and bar at Margaritaville attached and caught our cab back to the airport there. The DVD player was not working so I was sorry I had packed some movies, but that's certainly not a make or break feature! Overall we found this condo to be very convenient and comfortable and the beach, even by Seven Mile Beach standards, was superlative. Convenient location, beautiful view, great complex! When we arrived, the first thing we noticed the amazing view of this first-floor unit overlooking the beach. Walking on seven mile beach daily, this resort by far has the best beach and is the only one with a protected cove, which is nice. Everything was very convenient as it shares the facilities/amenities of the Margaritaville resort, multiple pools, swim-up Margaritaville bar with daily happy hour (that other condo's would not have) Grocery store/liquor store and restaurants very close by. Going into town is a breeze. No safety concerns whatsoever that you see on other islands, Larry was very responsive and answered any and all questions. Overall great experience and would definitely rent again. We enjoyed every minute of our stay. The condo is on the first floor which made it very accessible for my MIL as well as convenient for walking out to the beach. The view is spectacular. The beach with the protected cove was absolutely perfect for my kids. They loved all the shells and coral and learning to snorkel. There is a dive shop very close by with helpful staff and inexpensive rentals of snorkeling gear. There are beach chairs and umbrellas already set up on the private beach. The owner was personable and responsive to all my questions, and a joy to interact with. Grand Cayman will definitely be on my vacation list from now on and would definitely stay here again! In fact, already thinking about when we can return. Awesome property for a family! WOW! What a location! Walk right out onto the beach or pool. Just fabulous location. Fully stocked kitchen to support your family. Hard to walk the 7 mile beach due to beach loss but we walked on the street and cut over just past the Marriott. Would definitely return soon. Owner extremely easy and attentive to work with. We stayed at Sunset Cove (in unit #122) in December 2018. We were fortunate to have the first floor unit directly in front of the beach. The beach is large compared to the other hotels/condos that we saw on SMB. We walked from our condo all the way down to Camana Bay and none of them had the expansive beach that Sunset Cove has. The Marriott resort nearby has a tiny beach the size of our living room and some small pools (and they charge a fat resort fee). The sea water is clear and calm (due to the protective barrier rocks surrounding it). This is a perfect spot for young children to enjoy the beach without worrying about big waves. Also, the snorkeling around the sunset cove was just as good as the snorkeling excursion that we took via boat excursion. If you swim along the rocks on the inside of the cove, you will see smaller fish. If you swim to the outside of the rocks, you will see bigger fish. I saw an enormous puffer fish (about 10 inches tall and 18 inches long). As you get closer to the shore (and water is more shallow) you will see lots of sea urchins. Just bring your snorkel gear and aqua shoes (since there are some rocks). Our condo unit had 2 beds and 2 baths. We enjoyed having the extra room to lounge around, the fast wifi, the washer and dryer (for washing all the swim clothes daily). We enjoyed being situated so close to the beach. We dined at many restaurants on Bay Rd (Peppers, XQ, Coconut Joes, Cimboco, and A la Kebab). It is very safe and easy to walk to and from the restaurants at all times of day. We also took the bus to and from downtown (easy process, $2.50 USD each way per person). Just walk outside to the main street and flag down the public bus #1 or #2 routes take you to/from downtown. The owner Larry replies very promptly via email and text. 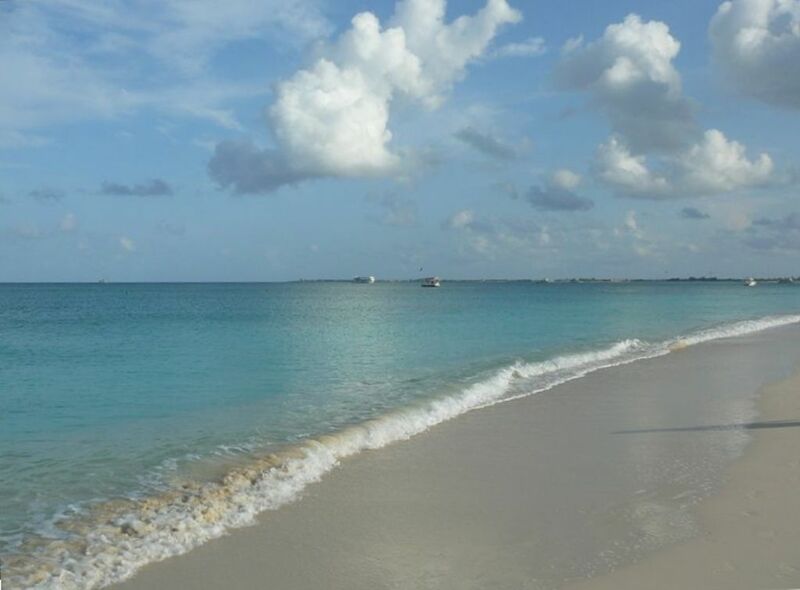 We highly recommend this specific unit and condo complex to anyone looking to stay on SMB in Cayman!